Hollywood haters, you can breathe a sigh of relief: after many months and endless coverage, the 2015 awards season is finally over. Last Sunday's Oscars was the final event in the seemingly never-ending stretch of ceremonies, and stars, critics, and fans alike can finally rest easy knowing that they don't have to hear the words "awards bait," "swag bag," or "mani-cam" for the rest of the year — well, at least for another six months, until the Emmys air late this summer. Sorry. Save for a few cringeworthy moments (really, Jeremy Renner? ), the awards show was a wonderful celebration of feminism. Tina Fey and Amy Poehler hosted, spouting one-liners about Hollywood's ageism and Amal Clooney's incredible career; winners like Maggie Gyllenhaal and Amy Adams shouted-out to those who create complex female roles; female-driven shows like Transparent and Jane the Virgin took home prizes and were praised for their realistic depiction of women. 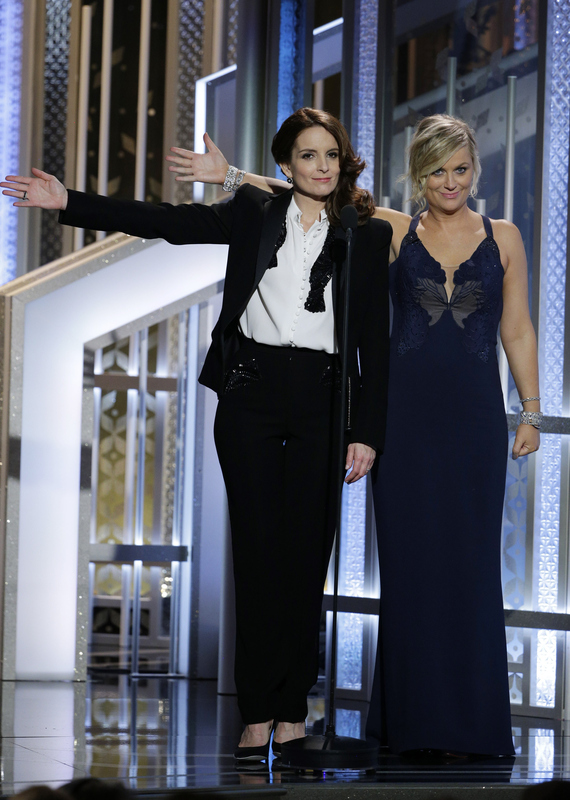 Of all the ceremonies this awards season, the Golden Globes were, by far, the most feminist. On Jan. 15, the awards show honored some expected female nominees, like Julianne Moore and Patricia Arquette, but also acknowledged those forgotten by Oscar: Gillian Flynn, for writing the female-driven Gone Girl; Emily Blunt, for portraying a badass solider — not, as she happily noted, another "damsel in distress" — in Edge of Tomorrow; and Jenny Slate, for starring in the heartwarming, hilarious, and incredibly feminist Obvious Child. There was also an MVP award for Jessica Chastain (who gave an amazing speech), and two directing nominations for women, for Ava DuVernay and Angelina Jolie. The Critics Choice Awards aren't typically taken too seriously, but with a line-up like that, maybe they should be. Feminism at the SAG Awards didn't start off on a good note —note to interviewers: when talking to a female celebrity, ask questions about her, not her husband — but it improved substantially as the night went on. Orange is the New Black won Best Ensemble in a Comedy Series, Drama Actress winner Viola Davis thanked her Murder producers for believing that a “49-year-old dark skinned, African-American woman” could star in a TV show, and J.K. Simmons spent a large portion of his speech talking about how grateful he is for his talented, role model wife. Not a bad night, overall. Sunday night's show contained several instances of feminism, from Patricia Arquette's equality-demanding speech to the effects of the #AskHerMore campaign as seen on the red carpet. Unfortunately, the rest of the show wasn't nearly as female-friendly, with the lack of women-led films in consideration becoming more obvious with each passing category. Still, there was nothing in the night that was outright sexist or discriminatory, and the fact that feminists like Julianne Moore and Arquette took home awards is certainly worth celebrating. The Spirit Awards honor the best low-budget (at least by Hollywood standards) movies of the year, and more often than not, those are the films willing to take a risk when it comes to issues like feminism and diversity. So it's no surprise, although certainly appreciated, that the 2015 show honored female-friendly films and people like Ava DuVernay, Obvious Child, and Iran's groundbreaking A Girl Walks Home Alone at Night. In terms of feminism, there wasn't much of note happening at the BAFTAs, known as the British Oscars. The show honored expected female winners like Moore, but also showered praise on male-led films like Boyhood and The Grand Budapest Hotel. Nothing wrong with that, of course, but nothing particularly feminist about it, either. An average awards show. No show this season was more disappointing for feminists than this year's Grammys. The night's hypocrisy was simply astounding, with convicted and alleged abusers like Chris Brown getting honored for their careers moments after a domestic abuse survivor (and President Obama!) spoke about the need for empowerment and change. Any feminism the show attempted to have — Katy Perry's "By the Grace of God," for instance — was diluted by its ignorant, unmissable display of hypocrisy.